AUFGABE DES MONATS FEBRUAR - LÖSUNGEN UND KONTROLLFRAGEN ONLINE! 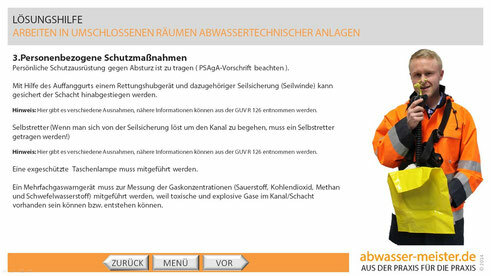 Überprüfe Deine Antworten zur Aufgabe des Monats ARBEITEN IN UMSCHLOSSENEN RÄUMEN ABWASSERTECHNISCHER ANLAGEN auf Richtigkeit. Dein erlerntes Wissen kannst Du mit Hilfe der Kontrollfragen überprüfen, wobei Du mindestens 50 % der Fragen richtig beantworten solltest. In der Aufgabe des Monats März sollst Du dich mit der Außerbetriebnahme eines Beckens beschäftigen. Because the admin of this website is working, no question very quickly it will be well-known, due to its feature contents. Hiya very nice website!! Man .. Excellent .. Wonderful .. I'll bookmark your site and take the feeds also? I'm glad to search out a lot of helpful information here in the post, we want develop more strategies in this regard, thank you for sharing. . . . . .
Hey there! Quick question that's totally off topic. Do you know how to make your site mobile friendly? My weblog looks weird when browsing from my apple iphone. I'm trying to find a template or plugin that might be able to correct this issue. If you have any suggestions, please share. Thanks! Hello! I just would like to offer you a big thumbs up for your great information you have got here on this post. I'll be returning to your blog for more soon. Hello there, I found your site by way of Google whilst searching for a similar matter, your website came up, it seems great. I have bookmarked it in my google bookmarks. Hi there, just become alert to your weblog through Google, and located that it's truly informative. I'm gonna be careful for brussels. I will be grateful should you continue this in future. A lot of other folks will likely be benefited from your writing. Cheers! I really like what you guys are up too. This kind of clever work and coverage! Keep up the great works guys I've added you guys to my personal blogroll.